The choice of the right profile sanding wheel for wood sanding must be determined based on the customer’s requirements. Our highly experienced engineers and application technicians would be pleased to advise you by phone or email, on a high quality and cost-effective type of profile sanding wheel of the FAPI-SW series for your process. The profile sanding wheels FAPI-SW are made of the same material used for flap grinding wheels. The significant difference lies in the highly elastic surface of the profile sanding wheel FAPI-SW. This is achieved with individual, disconnected slitted, abrasive cloth packages separated by a large distance to one another and fastened to the wheel hub. 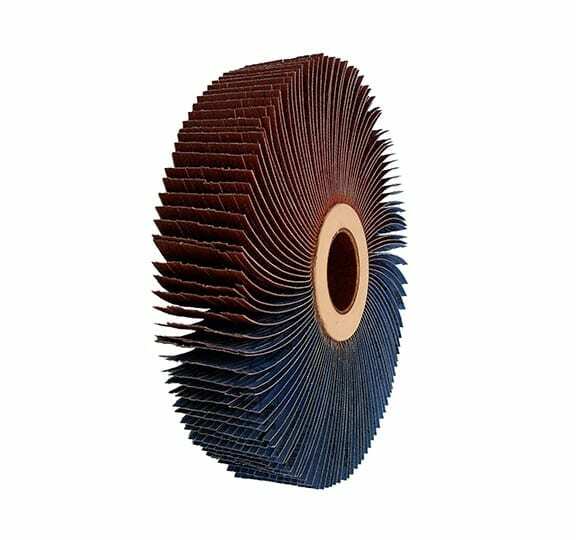 Thanks to the highly elastic surface, profile sanding wheels FAPI-SW are used primarily for finishing of wavy and curved wood workpieces. The optimal adaptation of the surface ensures optimal surface qualities on the workpiece. Other dimensions and bores on request!